At Explore the Bible we have a great resource called Explore the Bible On Location. 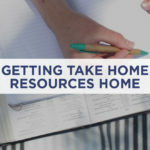 These videos are hosted videos and from time to time we hear from churches who want to know a little bit more about our hosts. We are going to give you a little glimpse behind the scenes of Explore the Bible On Location and let you meet our hosts. We’ve asked them a few questions and thought you might enjoy getting to know them a little bit more. Meet Joel! ETB: Tell us about yourself. Joel: I was born April 21st, 1987 in Thousand Oaks, CA. I moved to Nashville when I was 6-years-old. My mom’s name is Joan. My dad’s name is Dale. They’ve been pastors for the past 40 years. I have two older sisters: Gwen and Janelle. My wife’s name is Lauren and we’ve been married for 7 years. I have a 5-year-old daughter named Zoe Sophia and a 3-year-old son named Asher Daniel. My hobbies are exercise and cooking. I love to play sports, weight train, and hike. I love to grocery shop and cook my own food. I also love studying the Bible, theology, and church history. I can’t get enough. ETB: If you could travel anywhere you wanted, where would you go? ETB: What is your favorite childhood memory? Joel: My first Christmas in Nashville. Growing up in southern California, we didn’t get any snow (or cold weather). In December 1993, Nashville got a huge ice storm and heavy snow. My first Christmas in Nashville was my first white Christmas. We had a steep hill in our backyard and I got to sled down a snowy hill for the first time in my life. ETB: As a kid, who was someone in your church/in the faith you looked up to? Joel: There were a lot of people I looked up to; but I looked up to my dad the most. He loves Jesus and loves serving the Church more than anyone I know. He loves the Word of God and patterns his life after the Scriptures with more intentionality than just about anyone I know. ETB: How did you come to know the Lord? Joel: I grew up in a home where the gospel was preached constantly. 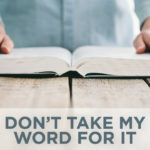 I grew up with biblical discipline and the training and admonition of the Lord. When I was almost 7-years-old, I knew three things without a doubt. 1. There’s something wrong with me; I can’t stop sinning. 2. There’s nothing wrong with Jesus; He’s perfect and the only One who can help me. 3. There’s a storm coming for my life; I’m going to be judged for my sin. This was a true work of the Holy Spirit! He was convicting me of sin, righteousness, and coming judgment. He spoke to me in a way I could understand as a rowdy 6-year-old boy. I told my mom and dad that I wanted to follow Jesus, be forgiven of my sin, and start a new life. From that day—April 25th, 1994—I was changed. I’ve been following Jesus ever since. ETB: Tell us about your church and how you serve there. Joel: New Song was planted in September of 1993. This year, we’ll celebrate our 25th year as a church. Our mission statement is, “Reaching neighbors, nations, and generations with the Good News of Jesus Christ’s love and power.” I’ve been serving in student ministries for almost 13 years. I’ve been a youth pastor at New Song for 8 years. ETB: What is your favorite Bible verse? Why? Joel: Hebrews 11:6. It shows me that God is a rewarder of those who diligently seek Him. Diligently seeking God is my deepest passion. As I constantly pursue a deeper knowledge and understanding of His Word, His will, and His ways, He’ll reward me with deeper revelations of Himself so I can more deeply reveal Him to a world in need. Joel: Most recently, it was a far deeper revelation of the word Shalom in Hebrew. In the past, I’ve understand Shalom to simply be an inner sense of peace, a comprehensive well-being, an absence of spiritual conflict. But as I studied the word more deeply in Hebrew, I realized that Shalom (the noun for “peace”) comes from the Hebrew verb Shalam which means to bring something to completion or make something whole. I began to see that the most basic idea behind Shalom is completeness. Shalom is the absence of absence. Shalom is the presence of fullness. And like we see in Judges 6, Yahweh IS Shalom. Jesus is the Prince of Shalom according to Isaiah 9. But Micah takes it further by saying the One born in Bethlehem shall BE peace. Jesus IS peace. What does He come to do? To seek and save that which is lost, to bind that which is broken, and bring to completion that which is lacking. ETB: What is God teaching you right now? Joel: To live a life of deeper meditation and holy contemplation. Psalm 1:2 says, “But his delight is in the law of the LORD, and in His law he meditates day and night.” I live a loud life. I’m a music teacher, I have two small kids, I predominately pastor teenagers and college students, I sit in lots of meetings, and I love movies, music, and sports—not to mention I constantly yell into a camera for Explore The Bible! The longer I walk with the Lord, the more I realize my need to hear Him speak to me and lead me. The Lord is teaching me to turn off the media and delight in the law of the LORD. He’s teaching me to develop a love for silence so I can more deeply contemplate who He is and what He’s saying for these days. By grace through faith, I’m trying to obey. ETB: What’s something about God that amazes you and draws your heart to worship? Joel: The God of the cosmos is the God of the details of our lives. The God who gives breath to billions of creatures is working to change my own heart to look more like Jesus. How could a God so great be so intimately aware of a man, like me, so small and insignificant? Like David says in Psalm 139:6, “Such knowledge is too wonderful for me; it is high, I cannot attain it.” All I can do is lift my hands and praise His name! 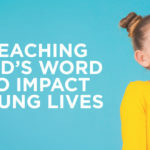 ETB: Why do you enjoy helping kids explore the Bible? Joel: I always think of Jesus’ words when He says, “Let the little children come to me and do not forbid them; for of such is the Kingdom of Heaven.” Jesus wants children as His disciples. He wants kids to follow Him. That’s amazing! I want to do whatever I can to help kids follow Jesus. Explore the Bible is such a great tool that helps kids see Jesus in the Word. I love hosting Explore the Bible because I basically get to be face-to-face with a bunch of new disciples. Teaching kids to follow Jesus is one of my greatest joys. ETB: What’s your funniest or favorite ETB moment? ETB: Have you met any ETB kids? What was that like? Joel: I’ve had the privilege of meeting lots of ETB kids and I’ve gotten to go to at least three different ETB kids’ classes. It’s the best! At first, they’re like, “Umm … is this for real? Why is Joel here? He’s so strange. I’m not sure I’m comfortable with Him being in my presence.” Then they warm up to me as I constantly joke with them and sing silly songs about whatever activity we’re doing. By the end, I’m the ETB Kids’ jungle gym! I’ve got kids hanging on my arms and my back, singing the silly songs we made up, and trying to get me to laugh. It’s one of my favorite things to do! ETB: What’s your biggest hope for the kids watching OR If you could say one thing to the kids watching, what would it be?